So two days after the amazing Woven Hand show in Vienna me and my friends travelled to the wonderful city of Prague. Luckily one of my friend knew this city very well and so he showed us the most beautiful corners of this breathtaking town. For me it was the first time that I was there and I was completely hooked. If you have ever the chance to visit Prague – just do it! You won’t trust your eyes! So after the sightseeing we went to the club Palac Akropolis. Ton, the tourmanager, told us that the show in Athens the day before was awesome – almost sold out and the people went nuts and sang „Black Soul Choir“ with David! Well, before we were going to see them again there was a local support band called Please The Trees. Nothing special at all but it was obvious that they were well known in their hometown. Back in 2009 I saw the fantastic Slim Cessna’s Auto Club live for the very first time. And this happened at the Grabenhalle in St. Gallen. So it was a kind of „back to the roots“ thing when we travelled to Switzerland to see this outstanding band from Denver again. And I hoped that more people will find their ways to the show – three years before (on the 23rd April) they played in front of a handful people but nevertheless the performance was one of the best I have ever seen (as you can check here). So this time there were two differences to the last concert at the Grabenhalle: First, more poeple showed up, secondly the performance was not that breathtaking again, BUT it was of course a very intense and excellent show (as you can see on the picutes below). Unfortunatley Dany’s bow was broken so no „Jesus is in my Body – My Body has let me down“ this time. And it was such a big pleasure to meet some of the good people again: Tony from Scotland and Carol from New Mexico were there too – like back in 2009! Also Sändy and Grit from Germany attended this show. More pictures you can see here! As it was the tour to promote „The Very Best Of“ album I was very curious about the setlist, which featured also some new solo tracks from Ian Anderson’s wonderful release „The Secret Language Of Birds“ from 2000. It was very nice to hear tunes like „Roots to Branches“ and „Hunt by Numbers“ again – but the big surprises for me were the songs „Sweet Dream“ and „Love Story„. I never heard these two Tull classics before live on stage. This time the line up was brandnew to me: Beside Ian Anderson, Martin Barre and Andrew Giddings two new members replaced Doane Perry and Dave Pegg: Dave’s son Matt played bass and Marc Parnell, who worked also on the solo CDs of Martin Barre, was sitting behind the drums. 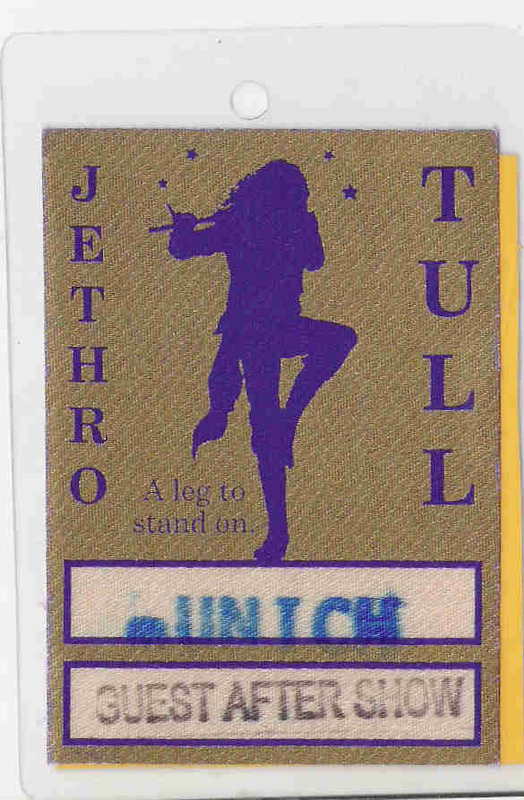 The year before Jethro Tull toured around the world to celebrate the 25th anniversary. In 1994 the band played cities and countries, which had to be skipped. 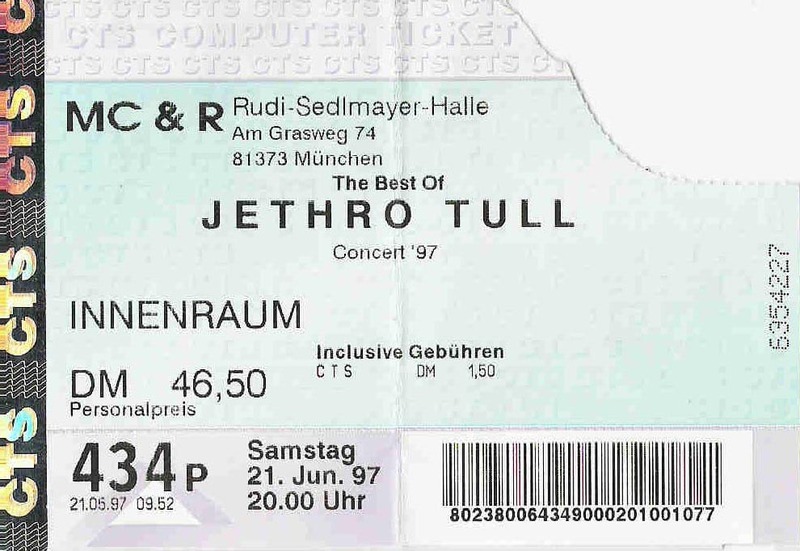 So it was obvious that the setlist would not change that much – but it was not exactly the same performance as in Vienna (see listed below – 30th June 1993) and Wels (3rd July 1993). 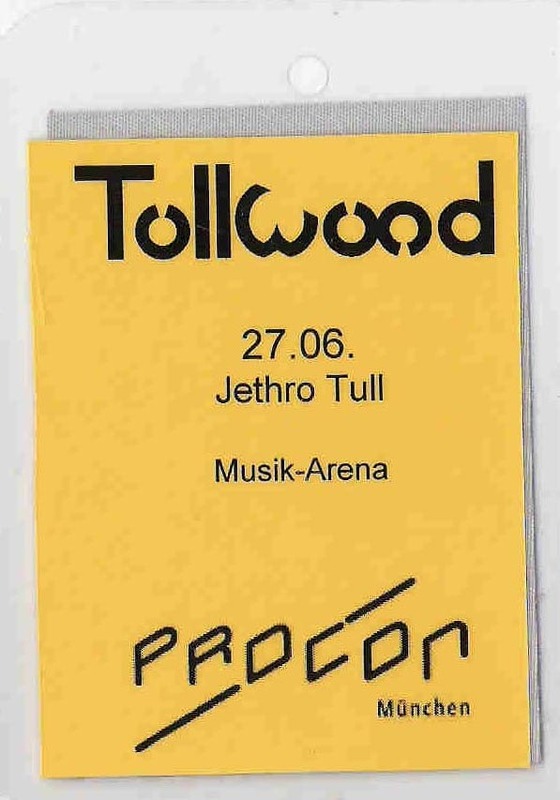 So my personal highlight was „Beggar’s Farm“ – the first time that I hear that track from the first Tull album „This Was„! Although there were those new boys in the band, the performance was excellent again. From time to time especially Martin helped the Marc a few times that he didn’t miss the entries. To this concert I was very looking forward because I became a huge fan of this outstanding band from Norway. 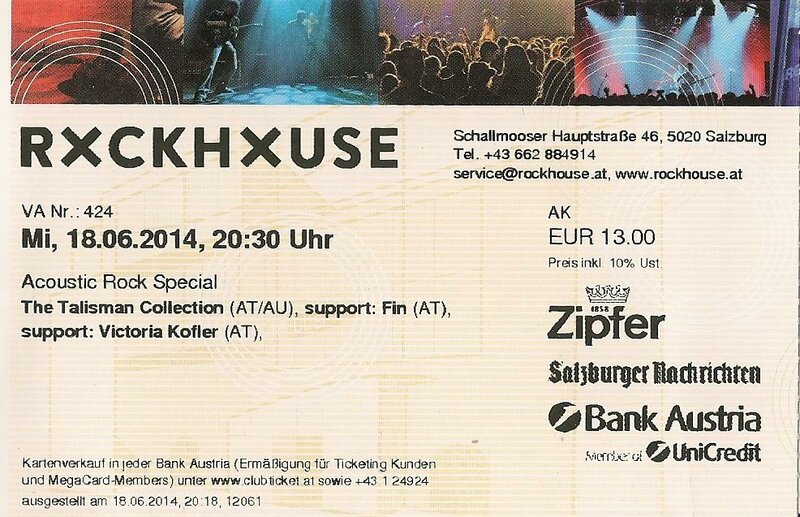 I missed their shows over the last years but this time me and my friends went to the Szene in Vienna to see Sivert Hoyem and the band the first time. Vidar Vang joined Madrugada singing a duet with Sivert on „The Kids Are On High Street“ and Lisa played violin on „Majesty“ and „Hold on to you„. 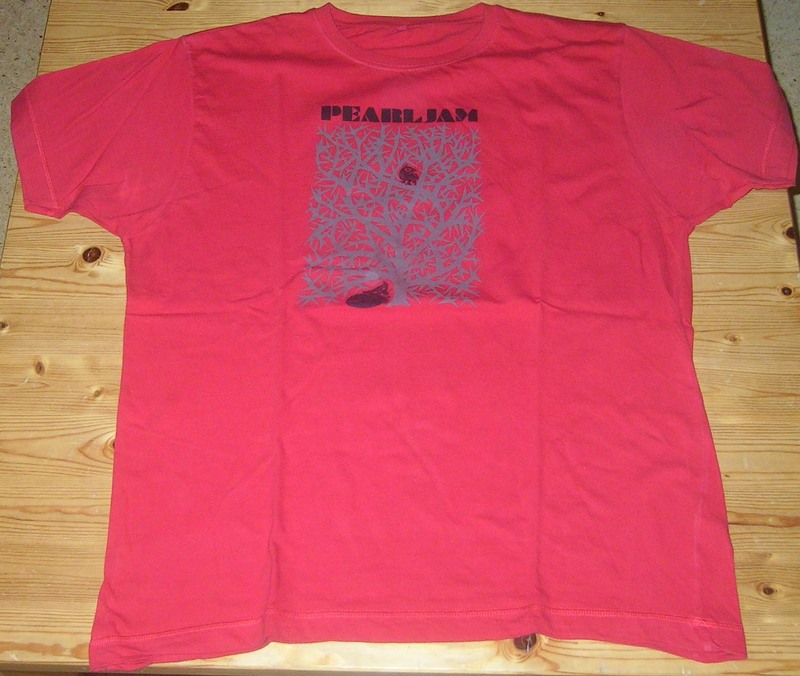 So on the way to Munich I thought about a so-called „Pearl Jam Wishlist“: Beside my favorites like „Rearviewmirror„, „Present Tense“ and „Do the Evolution“ I would love to hear rarities like „Down“ and some cover versions. So when I found myself in the hall and Eddie Vedder and his band opened with „Sometimes“ I was completely into the music. And I really didn’t trust my ears when Pearl Jam played all those songs I had on my wishlist 😉 And with the Who cover of „Baba O’Riley“ this amazing setlist was finished in a perfect way. And it proved my opinion again that Pearl Jam is one of the best live bands ever! After the show I bought this wonderful red shirt and also a photo book as a souvenir. Here are some videos of this awesome concert – enjoy! 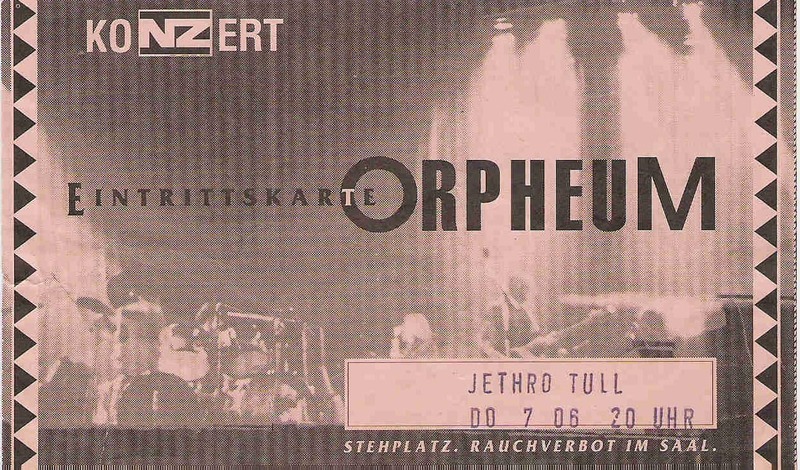 Anyway – Europe was in 2011 again on the tour schedule of the Auto Club and so I was very looking forward to see the best live band on earth again – this time in Nuremberg at the location called Desi. And it was the first time to see Todd „The Peeler“ Moore playing the drums in this band! He is also member of Munly’s project Munly & The Lupercalians and so I already saw him playing in Fort Collins and Denver back in 2009. Nice compilation of that festival feat. more Slim Cessna’s Auto Club you can watch here! 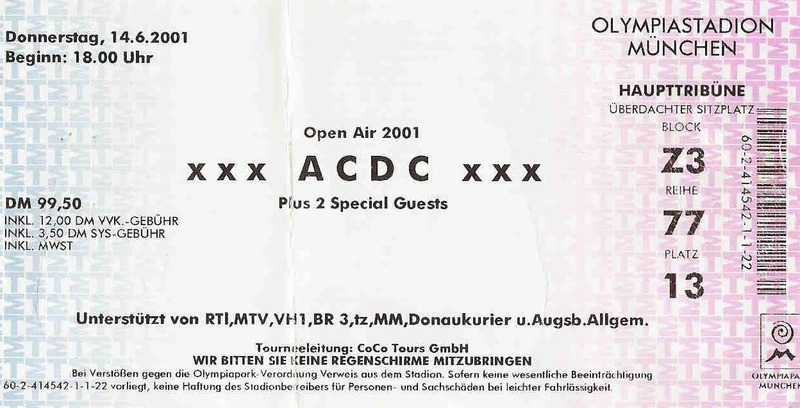 Oh – how was I looking forward to this: My very first live experience with AC/DC! Although I was very far away from the stage, this performance blew me away! The current album at that time was „Stiff Upper Lip“ – a brilliant record which was produced again by George Young. And so the sound is typically back to the roots and proved again, that Angus and Malcolm Young creat riffs which are timeless and outstanding. And when you look at the setlist listed below you might have an idea how spectacular this performance was. And after the first encore set the lights were switched on and many people started to leave the stadium. But the show was not really over yet – AC/DC came back for the classic „Shot down in Flames“! One of the best shows I’ve ever seen took place at the wonderful Residenzplatz in Salzburg. 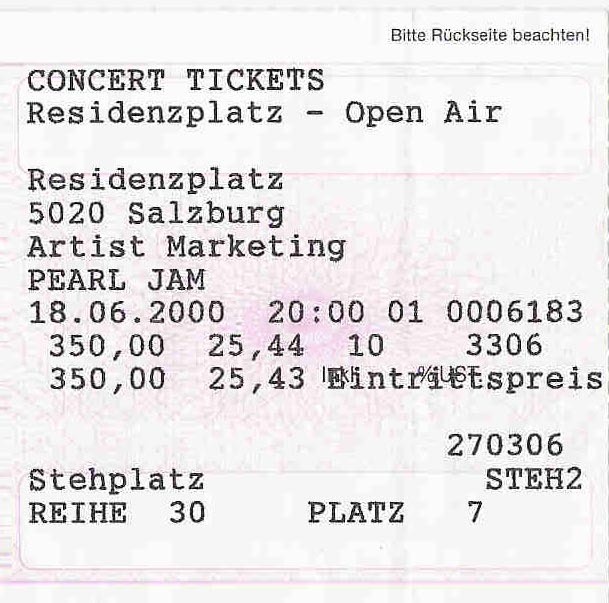 And it was my very first live experience with Pearl Jam! The weather was perfect and at the end of the show the full moon was over the stage. This was a very special and magic night – for the crowd and for the band. It was obvious that Eddie Vedder and his band enjoyed every second of the performance. Needless to say that I became a huge Pearl Jam fan after this outstanding night! And it was also the beginning of releasing all recordings of this tour – so I’ve got my own copy and you can get yours here! 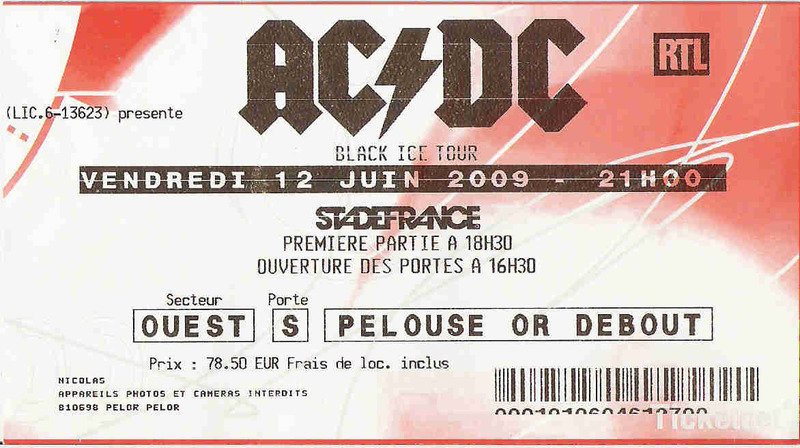 Then another „Black Ice“ show started – no surprises since the last shows and so AC/DC performed in their well known way: straight-forward as you can see on the videos listed below. * : with special guest Leslie Mandoki. Then Arcade Fire entered the stage with full force. It was the second time that I was seeing them live and it was again breathtaking! Just check out the videos listed below! „Der Standard„, „Kleine Zeitung“ & „Die Presse„. (incl. Masha and also Ian Anderson, Jonathan Noyce & Doane Perry on six songs). Unfortunately I can’t really remember this show. A friend of mine was a huge Gary Moore fan and so I accompanied him that night. And as I love Blues and Rock I was quite sure that I wll like this performance. And I really did, but I hardly remember any of the songs beside „Still got the Blues„. During the performance I wandered through the people – but nevertheless I enjoyed every minute of the show. The setlist was the same as in Bad Reichenhall. Also the „My Friend Harvey“ joke with the rabbit on stage during the „Mayhem Jig„. And unfortunately I also remembered when Martin did a little mistake during the opening riffs of „Aqualung„. I was quite sure that he disappointed himself in some way, because he is a perfectionist and this is one of the reason why Mr. Barre has a big reputation in the music scene. My first live experience with Kaizers Orchestra – an outstanding band from Norway! 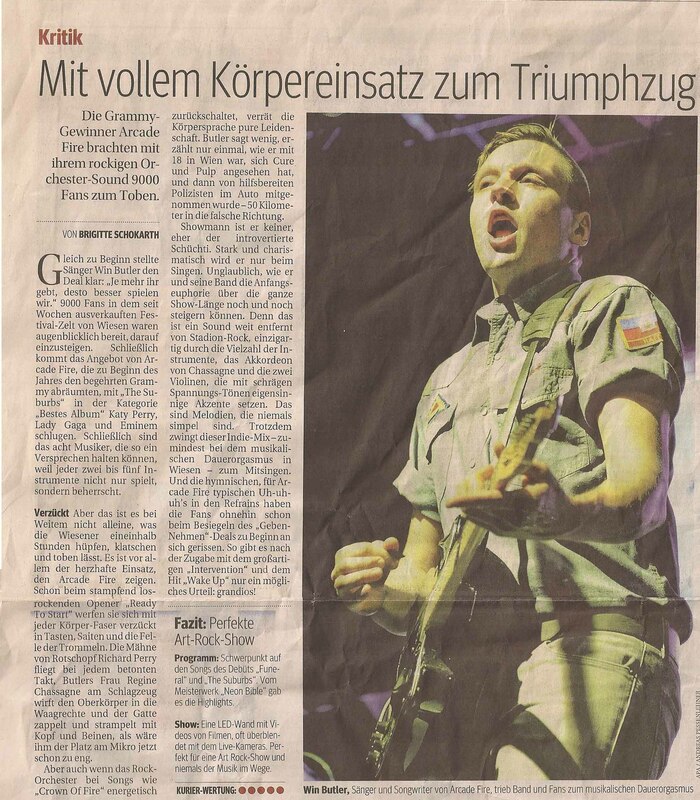 The show was part of the so called „Donauinselfest“ in Vienna. This festival takes place on an island on the Danube every year and it’s completely free. The Kaizers played as the last band on the FM4 stage and when you walked around the island you have to watch your steps because of splinters of glass, drunken people and it seemed that there was a huge alcoholic cloud all over the place. Anyway – the band didn’t disappoint me and they proved again why many people think that Kaizers Orchestra is one of the best live bands. Although all songs are sung in Norwegian the music and the performance hooked everybody immediately. If you have the chance to see this band live on stage – just be there! You won’t trust your ears and eyes when you see Kaizers Orchestra live the very first time! But be warned: You can be disappointed when you see them again, because the performances (apart from the setlist) don’t change very much. 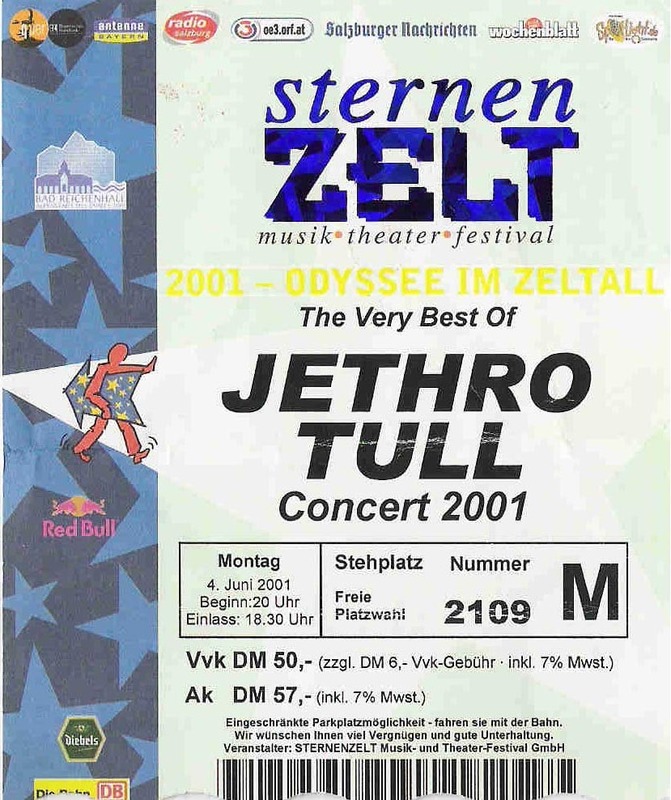 To celebrate the 25th anniversary of Jethro Tull me and my friends went to Vienna to see Ian Anderson & Co. performing at the open air location Arena. The Austrian musician Georg Nussbaumer did a fine support job. The blind piano player cheered us up in an entertaining way.